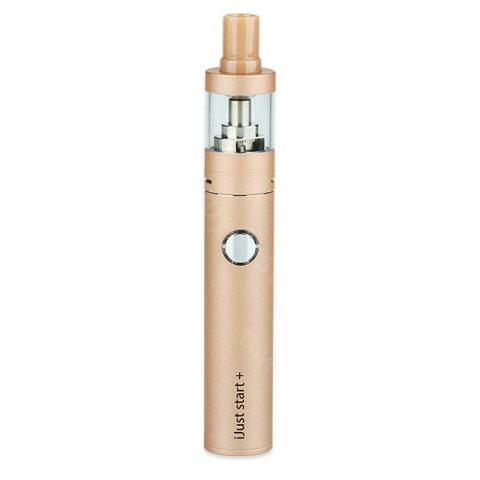 Eleaf ijust start plus kit 1600 mAh is an upgraded version of Eleaf ijust start kit. The battery comes with short-circuit protection,it can be more stable and reliable as a vaping gear. Eleaf ijust start plus kit 1600 mAh is an upgraded version of Eleaf ijust start kit.On the basis of retaining the original advantages,ijust start plus kit expand the capacity of the atomizer and the battery.The capacity of GS Air 2 atomizer for Eleaf ijust start kit is 2.3ml, it is 2.5ml for ijust start plus kit.And the battery capacity has been expanded to 1600mah in this kit.So, larger capacity means longer fun for you, and there is battery level indicator on the body as well, makes it more convenient to use.The ijust start plus battery comes with short-circuit protection, it can be more stable and reliable as a vaping gear.5 classic colors for you to choose. First, screw off the atomizer base. Charging: charge the device by connecting it with the wall adapter or computer via USB cable. The button light will turn red when the device is charging and the light will go out once fully charged. It takes around 3 hours to fully charge the battery with 1A wall adapter. With 13 days in house, Fast shipping!!! Look beautiful. If a problem to exchange standard to bubble glass, sat very well fixed, 30 minutes working on it been but eventually succeeded, haha. everything is OK! Fast delivery! Very stylish !!! I ordered it for my my husband . In the complete set there is all and even the instruction in Russian.pen kit.very easy to use.good for new vapor. The goods were sent and delivered for 3 weeks.the courier called to specify when it would be convenient and brought. Everything works . I was surprised at the speed of delivery!I have ijust s kit.but i think the iJust Start is bettery than it .long time vaping.good seller.